The second rifle came from Savage. 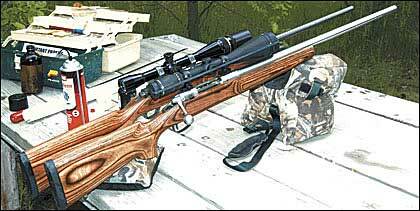 Dubbed the Model 12 Varmint, this rifle too sports a laminated wood stock. In fact, I wouldn't be surprised if it came from the same manufacturer as the one on the Ruger. The stock on the Savage is the new Low Profile version with a wide beavertail fore-end. Unlike the Model 77 repeater, the Model 12 Varmint is a single-shot version. The Savage is also available with a four-shot magazine. It sports a fluted stainless steel barrel and action. Will a .17 or .20 drift more than a .22 or 6mm? I suspect that with 32-grain slugs they will drift about the same as a .22-250 40-grain load. Loaded with 40-grain bullets, the .204 might drift slightly less. It'll be tough to predict and even tougher to measure. At this speed it'll drift far less than the parent cartridge, to be sure. To 300 yards, anyone shooting a .204 on prairie dogs is well equipped, in my opinion. Back home it was time to start the shoot-out. I picked a normal day with temperatures in the low 70s and the wind at my back. I used white Data-Targ benchrest-style targets stapled into position at a measured 100 yards. I started with clean, dry bores and quickly found that both rifles would put the first round from a clean, dry bore into the group that followed, routinely.